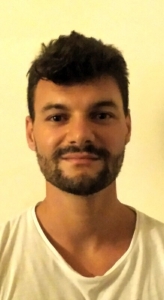 Giacomo Londi received his Bachelor Degree in Chemistry in April 2013 and his Master Degree in Chemical Sciences in October 2015 at the “Università degli Studi di Firenze” (Italy). He carried out his Master’s training within the Laboratory of Molecular Magnetism (LAMM) research group at the Department of Chemistry “Ugo Schiff”, in Sesto Fiorentino (Italy). Under the supervision of Prof. Dr. Federico Totti, his dissertation thesis dealt with ab initio periodic calculations based on the Density Functional Theory, in order to study the electronic and magnetic properties of a spin crossover system. After graduating and throughout 2016, he kept on collaborating with the LAMM computational group. In February 2017 he joined the Laboratory for Chemistry of Novel Materials as a PhD student within the Horizon 2020 Marie Sklodowska-Curie ITN Programme on “Spins for Efficient Photovoltaic devices based on Organic MOlecules” (SEPOMO).